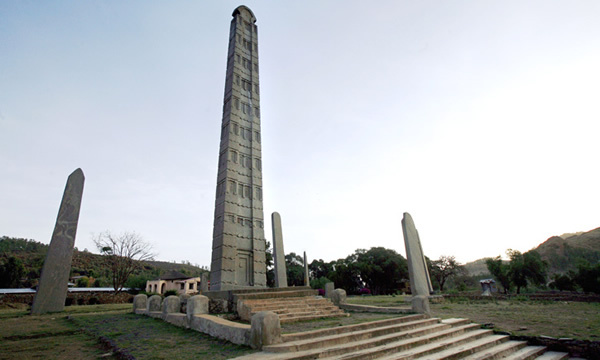 Most brain numbing monolithic buildings and structures from mankind’s history are usually built from many massive sized blocks, but the amazing stele at Axum in Northern Ethiopia, like many obelisks from Egypt, were crafted from one single piece of stone and therefore can also be referred to as examples of monolithic madness. 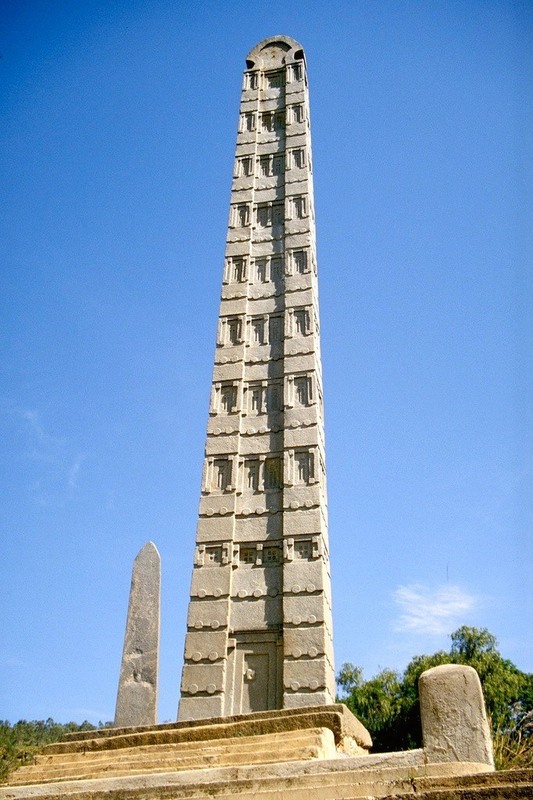 The 2nd – 4th century granite stele of Axum are said to be large vertical gravestones created to honour deceased kings and raised into place by sheer muscle power and determination, with the monarch’s grave or burial chamber generally located at the foot of the stele which was raised in his or her honour. 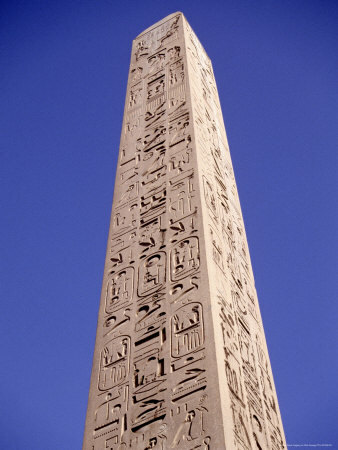 The main difference between Egyptian obelisks and the Ethiopian stele is their decoration. 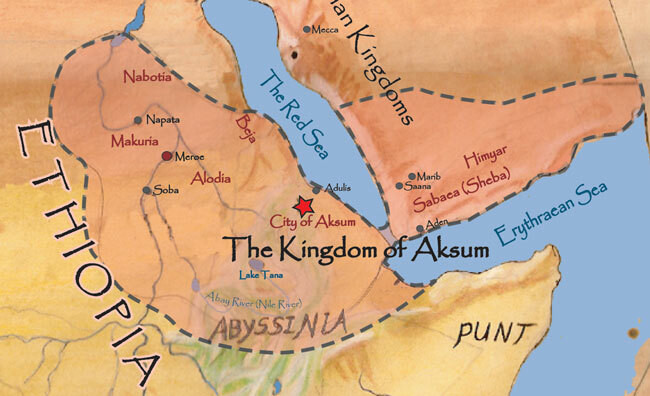 …but the ancient Ethiopians, or to be more precise the ancient Axumite Kingdom, decorated their stele with small doors at the base and multiple storeys or floors above, each floor bearing rows of windows. It is quite strange for the ancient designer from the 3rd or 4th century to have imagined such a multi storied building in a time period when most buildings rarely had more than 2 or 3 storeys, yet there the stele stand for all the world to see, like multi storey tower blocks, each carved from a single piece of rock. 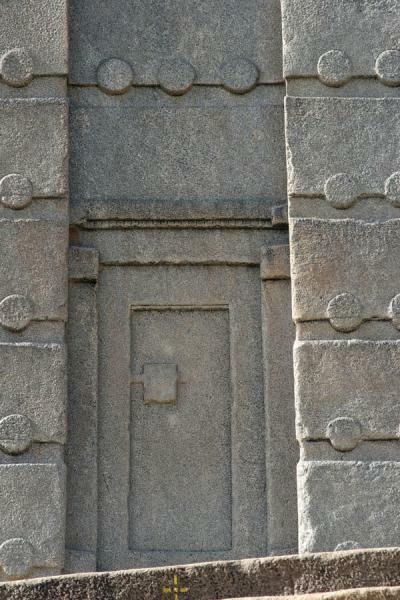 In the photo below, around the false door we can see rows of carved circles protruding from the stele. Below each row of circles there are straight horizontal grooves carved into the stele. What are these circles & grooves? Are they solely decorative? 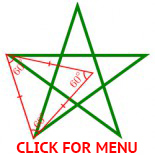 Or do they represent something related to the construction methods of real buildings that the Axum steles imitate? Answer – The circles represent the cross end sections of wooden bracket beams that jut out of the walls which they hold together. 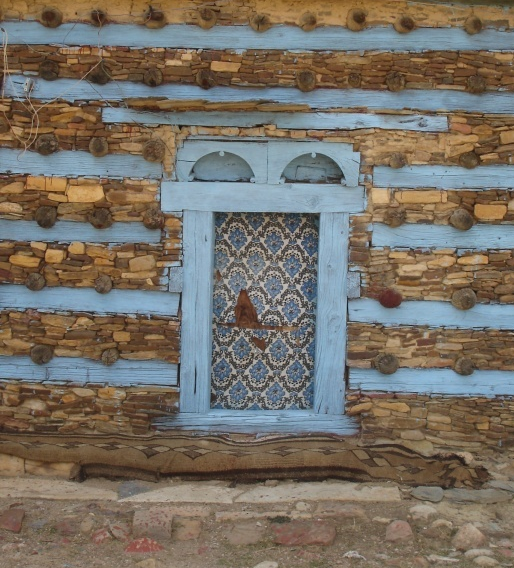 The horizontally carved grooves represent the wooden timber beams which are placed at regularly spaced layers throughout the cowanly constructed walls, as can be seen below painted in blue. 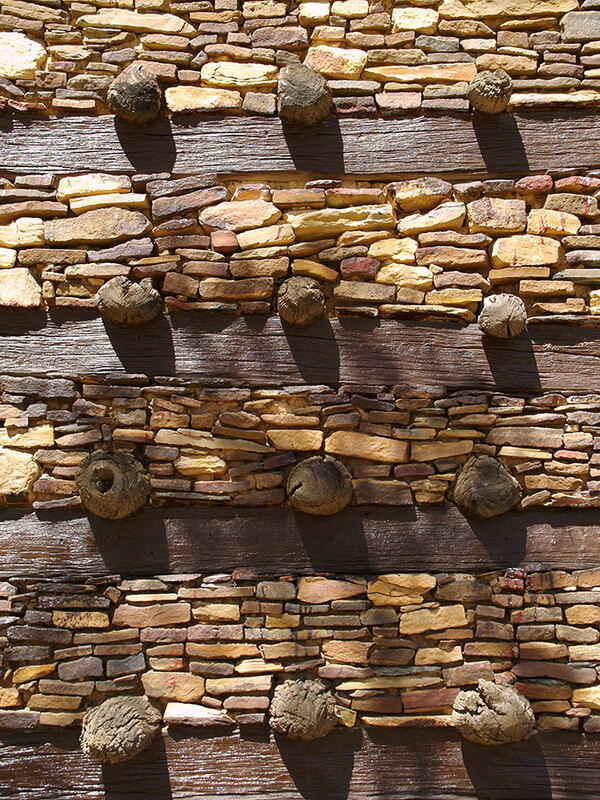 The protruding brackets (which are kind of dog bone shaped) sit astride two parallel horizontal beams, one on the outside of the wall and the other on the inside of the wall. In between these beams the mix mash of uneven rocks and bricks gradually thrusts outwards as it gets heavier with the adding of each new layer, but the brackets stop the horizontal beams from being pushed out from the wall. 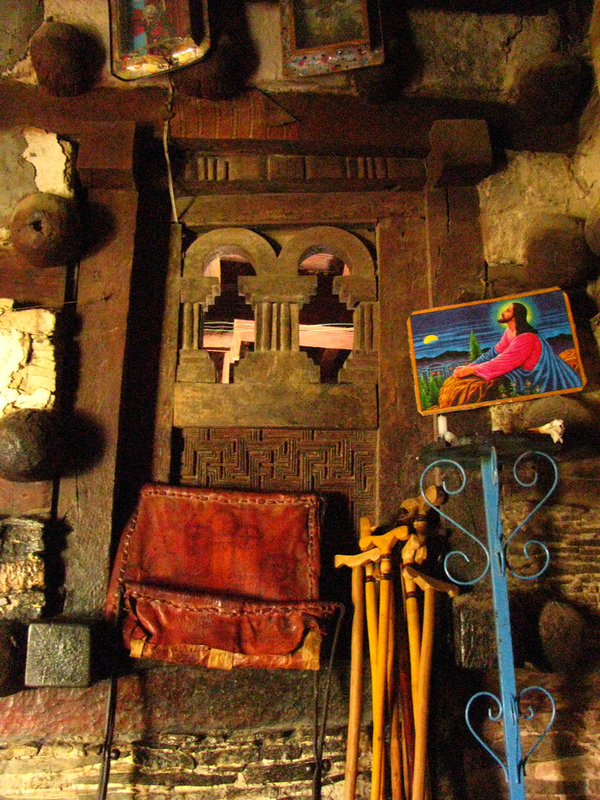 The ends of the brackets protrude on both the external & internal sides of the walls that they hold/pull together, as can be seen more clearly at the Debro Damo Monastery in Ethiopia. 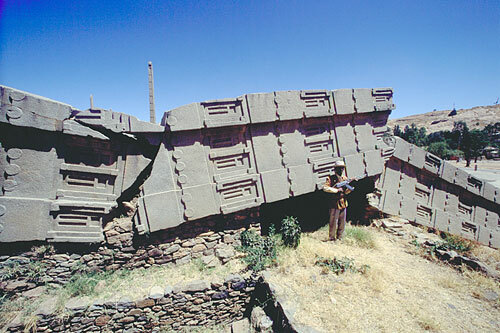 Now that we can safely assume that the circles and grooves found on the stele at Axum are stone representations of actual construction techniques common to Axum and Ethiopia, we are left with the baffling question of whether or not the ancient Aksumite kingdom actually did build 10 storey high buildings from bricks and wood before they conceived the idea to imitate them in carved stone? 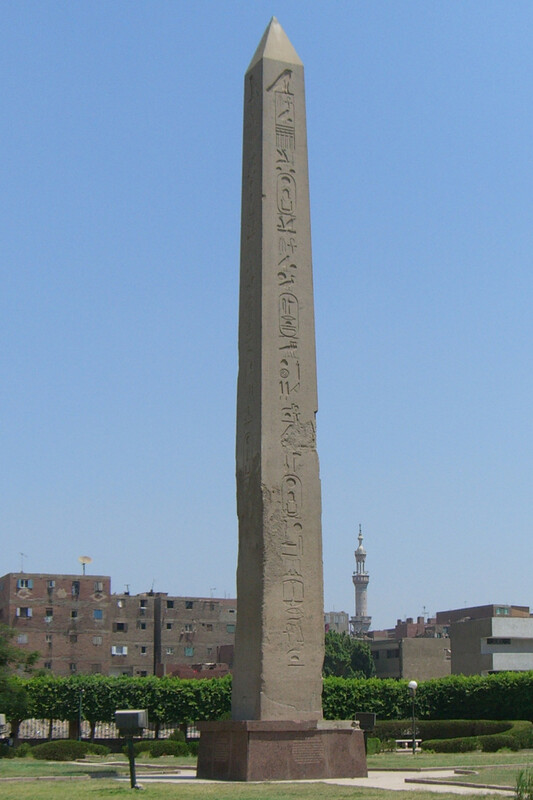 King Azanas’ stele has a door +9 storeys and stands 21 metres tall. 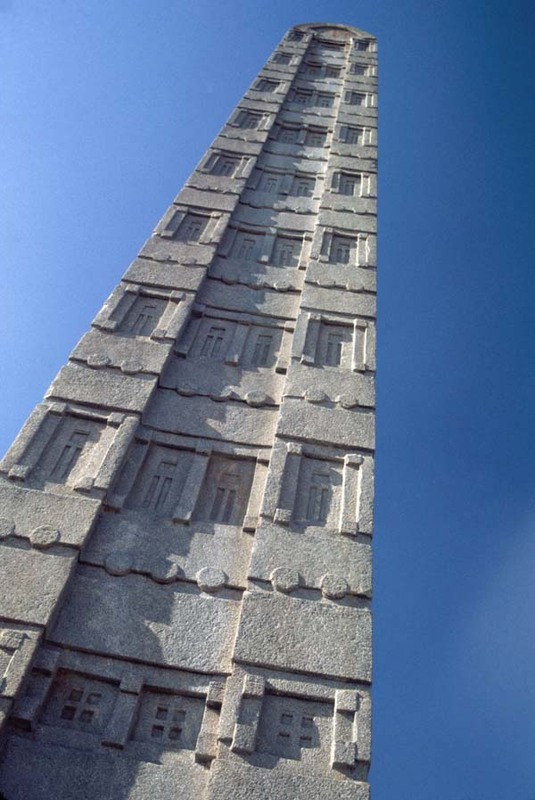 The stele known as the “Obelisk of Axum” stands 24 metres tall and has a door +10 storeys and weighs approximately 160 tonnes. This is the stele which the Italians stole in 1937. 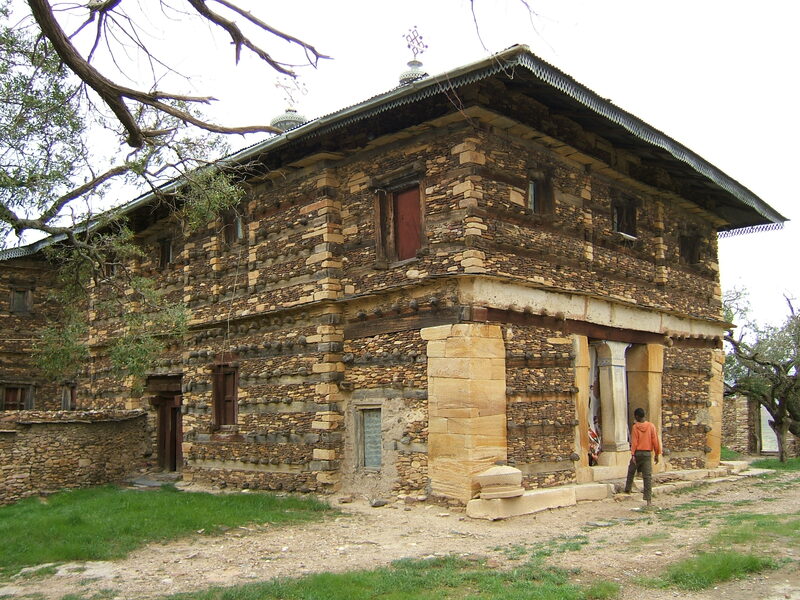 The UN decreed in 1947 that it be repatriated, but it wasn’t returned to Ethiopia until 2005, and finally re-erected where it now stands in 2008. 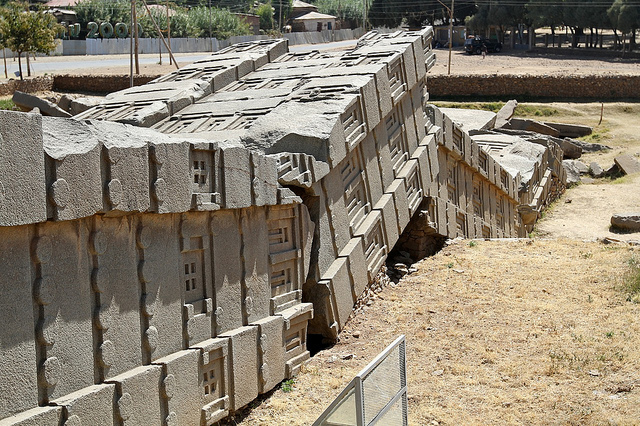 The stele credited to King Remhai, which is the largest of the known Ethiopian stelae, often referred to as the Great Stele, now sadly lays broken in 5 main pieces and was originally nearly 33 metres in length (door +12 storeys). It is estimated to weigh 520 tonnes, which makes it one of the largest pieces of stone ever shaped by mankind, and easily qualifies as an example of Monolithic Madness.